Pssst! My rose gold Rebecca Minkoff bag I get a lot of questions about is back in stock at Amazon, but there's only a few left!! Yessss- loving these jeans on you! I love these pants on you. I think they are perfectly paired with the charcoal sweater! Love this effortless yet chic look on you! I also love that you chose to wear flats for a more relaxed look! I recently got a plaid skirt with these same colors and love it! Such cute pants! I love the plaid. Great styling! Thanks for linking up...xo! Oh my word I want those pants! I wish we had a nordstrom rack in Canada, because I'd be all over these. I love this look. I need a plaid trouser this season!! Love, love the plaid pants! Perfect for the Fall. I love these plaid pants on you, the zippers are so cute too . 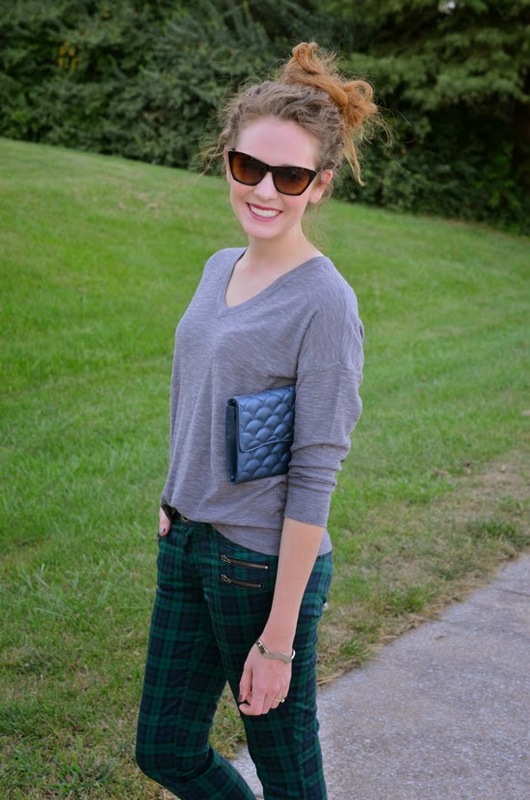 Pretty clutch and I like the grey with the plaid colors. Lovely! Absolutely gorgeous outfit! Love the pants! GREAT find!!!!!!!!!!!!!!!!! those are absolutely perfect!!!! Thanks so much for your continued support with Tremendous Tuesday!!! I love plaid! I haven't found a pair of pants I liked yet but skirts on the other hand... I may have 3. I'm a plaid freak too...and yes, I have plaid pants. But these are crazy fabulous!